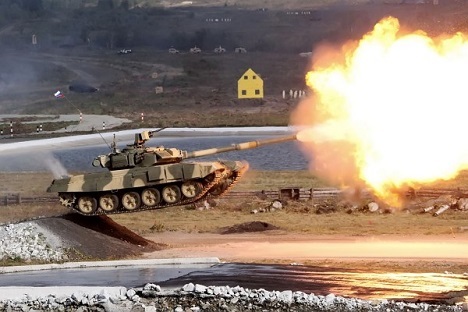 Using the latest Russian technology, India is expected to manufacture a further 15,000 Invar missiles for the T-90 tank. India will receive a manufacturing licence to produce 15,000 Russian Invar anti-tank missiles, which were designed for the T-90 tank. New Delhi previously purchased 10,000 of these missiles from Russia (produced directly by the manufacturer). The average cost will be around $2,000 per missile following acquisition of the manufacturing licence. · It is fitted with a retractable stabiliser (across a 250 mm / 9 inch range), which helps with aiming (the missile is guided along a laser beam, controlled by the tank gunner). · It has a maximum range of 5,000 m at a speed of 350 m/sec (the maximum speed for a flight of 14 seconds). · It has a tandem warhead, with a dual application in combat: it first penetrates armour up to 900 mm (35 inches) thick, and it then ensures detonation of the warhead. It has to be said that India has purchased the latest modification, along with a licence to manufacture a further 15,000 missiles. In accordance with existing agreements, India is to receive around 1,400 T-90 tanks by the end of this decade. The T-90 first entered service in 1993, and India is the largest country to use this system. India is planning to form 21 tank battalions by 2020, all equipped with the T-90 tank. In fact there are only 45 combat ready tanks in each battalion. The other 17 are either in reserve or intended for training purposes. First published in Russian in i-mash.ru.